A recent wedding in the eastern part of Nigeria has got people talking and the reason is obvious. 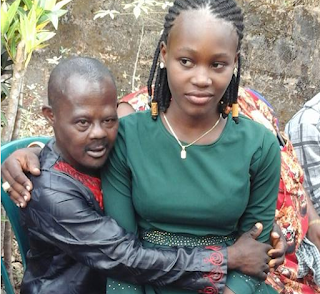 A man who is said to be mentally unstable tied the knot to his beautiful young bride in a traditional wedding graced by family, friends and associates in Ozubulu area of Anambra State. Internet users have been left wondering on how and why such a wedding was allowed to take place even considering the age gap between the couple. [i]I know that they brainwashed this girls family that the girl will take care of Izu's large share of land's and other properties, but that will not make them to destroy this little girls future.